On the afternoon of 21 January 2017, CCIEE and Xinhua News Agency National High-end Think Tank co-hosted the Fourth “Research on International Economy” seminar, under the theme of “Trump’s New Policy and China-US Economic and Trade relations”. Wei Jianguo, Vice Chairman of CCIEE made an opening remark. Zhang Yansheng, Chief Researcher of CCIEE, Yuan Peng, Vice President of China Institute of Contemporary International Relations, Din Yifan, former Deputy Director of World Development Institute of Development Center of the State Council, Huo Jianguo, former President of the Chinese Academy of International Trade and Economic Cooperation under the Ministry of Commerce delivered their speeches and exchanged views. 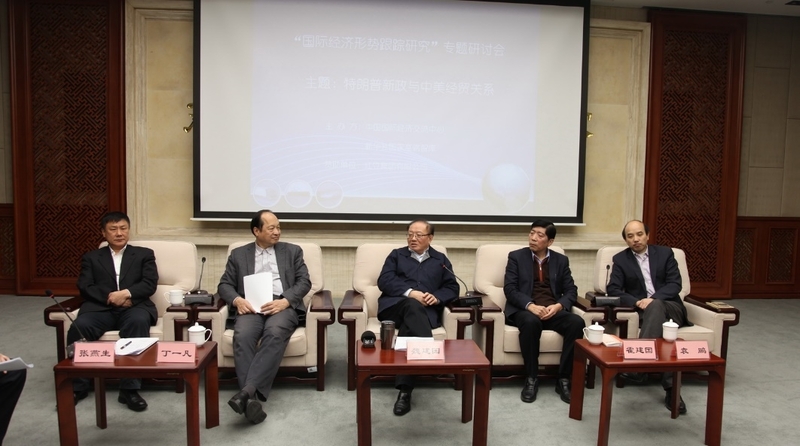 Zhang Huanbo, Head of Reform and Opening-up Division, Economic Research Department of CCIEE, presided over the seminar. Wei Jianguo pointed out that globalization will not back down but continues to move forward. China-US economic and trade relations are still the ballast stone of China-US relations and play a very important role in ensuring global prosperity and stability. The advancement of China-US relations may experience a slowdown in the early days of Trump Administration, but it will be on the mend in the medium and long-term. The current period is critical for the China-US relations and think tanks should give their role into full play, assume responsibility for their countries, contribute their wisdom, and come up with good ideas and practical solutions. Meanwhile, think tanks in the US and China should strengthen communication. Zhang Yansheng reckoned that globalization is accompanied by global openness, marketization and new technological revolution. Globalization is the golden period for world economic growth and therefore, whoever gets on the train of globalization will be able to gain growth. Countries around the world have shared the fruit of globalization, including China. Nonetheless, globalization has also encountered some problems and the core of those problems is the unfairness in the participation of globalization. Excessive financial innovation leads to a hollowing real economy and global governance does not fit the current trend. In his inaugural speech, President Trump stressed on buying American products, hiring Americans and America first. The facts, nonetheless, will prove that China and US are not a zero-sum game, but much more than that. Yuan Peng noted that the US has entered into the “Trump era”, which will produce a more violent shock to the China-US relations than expected and thus, we should be fully prepared for that. Trump is rather complicated, a smart businessperson, the oldest president in the US history and his understating of politics is no less than ordinary politicians. Meanwhile, he is also a guest performer who enjoys the publicity. We should have enough confidence to deal with him and fight with courtesy, power, and preparation. Din Yifan expressed that western media have reported repeatedly that Trump administration will make China its enemy but we should not take this seriously. In fact, Trump has not got a clear framework for its policies toward China. The truth is that Trump has started a war with the mainstream media during his presidential campaign, and now many people want to set trap for him. Right now, the priority for Trump is to focus on domestic affairs and thus he will not have big moves on foreign affairs. Campaign slogan and actual governance are two different things. Despite the frictions in some sensitive areas, such as trade and east Asia security, China-US relations will not derail. Huo Jianguo said that as can be seen from his inaugural speech, Trump has somehow restrained himself, comparing with his performance during the presidential campaign. He can now consider issues and express himself professionally and thoroughly. However, he is still very bad-tempered, bold and ambitious. In the short-term, it will be very difficult for him to deal with domestic issues because of the huge fiscal deficit and the difficulties in launching tax reduction and infrastructure construction. A full-scale trade war is unlikely to break out between the US and China but there will be more frictions between the US and China over trade. In response, we should be well-prepared, accelerate further reform and opening-up and create a fair international environment. At the end, the experts and audiences had a great discussion in the Q&A section.